In a game of reiteration, like a magazine cover that shows someone holding that issue of the magazine, here is the moment when this website was officially launched. On 28 September 2016, we held a public event at Colchester Town Hall to celebrate the launch of the Essex Sounds audio map. We were delighted by the good turn-out and positive feedback. 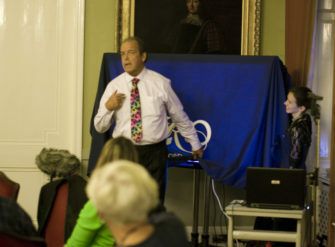 Cllr John Spence, Essex County Council Cabinet Member for Heritage, Culture and the Arts, officially unveiled the site. But the website will never be complete. We now need your help to keep it growing, to keep collecting the sounds of Essex. Find out more about how to contribute, then get recording!